Bishop Tawadros has become Egypt’s 118th Coptic Pope after his name was picked from a box by a blindfolded child during Sunday's altar lottery at St Mark's Cathedral in Abbasiya, Cairo. The new Pope of Alexandria and Patriarch of All Africa in the Holy See of St Mark the Apostle succeeds Pope Shenouda III who passed away last March. Pope Shenouda led the church for forty years and was chosen in a similar lottery in 1971. Bishop Tawadros is auxiliary bishop for Beheira and auxiliary to ِArchbishop Pachomios (who is currently serving as acting Pope). A member of the Holy Synod, Tawadros was born in 1952 and studied pharmaceutical sciences at Alexandria University. He was ordained bishop in 1997. The newly chosen pope was supported by members of the Coptic Laity Council for "his wisdom, firmness and ability to maintain good rapport with everyone in his province; both Christians and Muslims alike." Bishop Rafael, Bishop of Central Cairo and Heliopolis, who is one of the three leading candidates for the papal seat, also nominated Tawadros for the position because he is widely respected in the Coptic community. Following an 8am mass on Sunday, acting pope Bishop Pachomios led altar boy Bishoy Gerges Mossad, to the altar, where the young blindfolded boy chose the name of the new pope. The three finalists who entered Sunday’s lottery were: Bishop Rafael, Father Rafael Ava Mina and Bishop Tawadros. The road to choosing a new pope began immediately after Pope Shenouda’s death, when 76-year-old Pachomios' was appointed as interim pope. The Church then formed a committee mandated with drawing up a shortlist of nominees to become Shenouda's successor. Another committee was also tasked with choosing electors – those members of the Coptic community who would have the right to cast ballots in the papal electoral process. A total of 2,406 electors were chosen, drawn from among Coptic archbishops, bishops, lay council members and agents of the archdioceses, as well as prominent Coptic laymen including Coptic newspaper editors-in-chief and members of the Egyptian Journalists' Syndicate. On Monday, 29 October the five candidates entered the penultimate stage of the papal election, when the electors chose three finalists. Bishop Rafael garnered 1980 votes, the highest among all the candidates, taking 32.36 per cent of total votes. Bishop Tawadros received 1623 votes, taking 26.53 per cent of total votes. Father Raphael received 1530 votes, totalling 25 per cent of the votes. Bishop Pachomios had kicked off the final ceremony early Sunday, by reading the names of each candidate out loud to the congregation. The names were written in bold on large rectangle shaped papers. Each paper was then tied and placed in a black box, which was sealed with red wax. The new pope is faced with the task of leading Egypt’s Coptic community in a politically uncertain climate, following the last year's popular uprising. Islamists and Salafists continue to push their religious agendas, following the election of a Muslim Brother as Egypt's president and the ongoing constitution-drafting process. Challenges also lie within the Church. Bishop Rafael, for his part, said the new pope must devote himself to reorganising the church from within; set specific rules for the promotion of monks and priests; make an effort to draw alienated Coptic youth back to the church; and reinvigorate church services by preparing servants from the laity capable of keeping abreast with technological innovations. The new pope will also have to tackle critical issues including obtaining state approval to amend the church's 1938 bylaws – which lay down the rules governing Coptic divorce and remarriage – and the controversial 1957 bylaws regulating papal elections. Bishop Tawadros will be officially enthroned as Egypt's 118th pope on the 18th of November. How come this man is selected by a lottery, lottery is gambling. No offence, this guy looks very unclean, beard is going in all directions looks like a fugiyive to me. This is very interesting process, I have watched how the boy selected the ball several times. I couldn't help my self asking, has the child been guided by the stronger hand that lead him to the jar? the relative size of the child hand, the ball size, size of the container ,and the direction where the leading man left the boy's hand , is something to consider when looking objectively to the selection process. 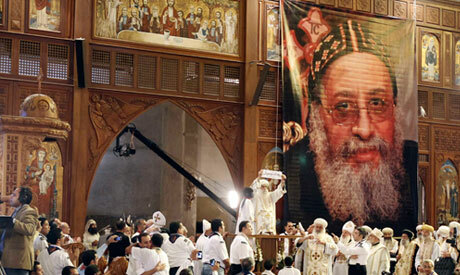 I truly wish the new Pope and the Coptic population the best. This is just a mathematician's observation. Pope chosen by alter lottery- Why? If the process is to be democratic, then the one who got highest number of votes must be chosen. Dear Mona: That's the difference between your opinion and the west: In fact nobody would be 'up in arms' in the secular west for such a silly reason.... You really have no idea. @Mona... it is a lottery! Some has their name picked, in the roman catholic church, the person with the most votes is made pope, the coptic church is different, it chooses a child to pick one of the 3 names, hence, it IS a lottery, Please don't comment on what the west would do, because you have no idea... you are just another complaining about the west for no reason!!! Al Ahram wo't stop this sarcatistic "Lottery" word since the beginning of election. If they said this to the Roman Pope election, all the West would be up in arms. Al Ahram should know it is called a; " Secret Election" !!! I hope it is the beginning of peace and hatmoney among all Egyptians.ALexandrai church is the second holy place after Jarusalemchurch for Egyptians copts suffered and helped Arabs to free them from slivery by ROmans. They built the first mosques in Africa south Maadi called Amr Iben El-as mosque as a gift. The mosque is surrounded by several churches as symbol of tolerance. Allah Akber. The prayers of all Christendom accompany the election of this holy man! May God be praised! May he make it a priority to have good relations with all Egyptian Muslims, our brothers in monotheism!